This is a rotational momentum strategy that picks the top 3 ETFs from a group of around 70 total ETFs based on custom performance metrics. It trades once per month. This strategy has a good amount of volatility. 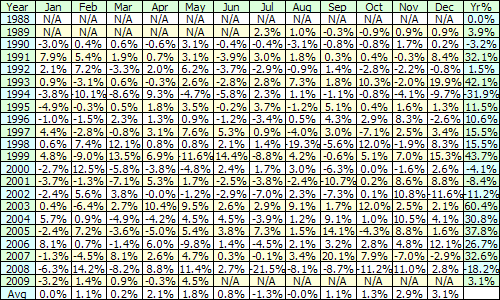 It is not unusual to see -7% or -8% months while the strategy corrects. However, it is important to stick with the strategy – during sell-offs, the strategy takes time to adjust to the current market conditions. So, it may be down -8% in one month to come back and be up 10-12%. The fund performed “ok” during the bear market of 2000-2002 – meaning it was down -10% each year which is bad, but not as bad as the major indices. Now, that said, since 2002, we’ve seen the introduction of a lot more ETFs – as a result, I believe the future returns will be better than past because of the increased diversity and sector-specific ETFs now available. For example, we have been long SLX (Steel ETF) for a bit and that has performed fantastically – and it was not available in 2002. The Gold and Silver ETFs, along with the commodity ETFs, have also recently been introduced providing a large number of diversification options for investors. I use this portfolio to manage approximate 30% of my total portfolio – meaning that I use this as a component of an overall portfolio to reduce the effects of the volatility. Do you mind sharing a bit what performance metrics you use? I’ve looked at a similar approach in the past but could never settle on a lookback period I was comfortable with. I’ve also considered testing an adaptive lookback period but I’ve put this project on hold for the time being. this is going to be a great blog. best of luck with it. Appreciate the positive remarks – I hope I can live up to them! I can’t share the performance metrics – but the lookback period periods I’ve found most effective are created by looking at a combination of lookback periods. A simple system using a 12 month lookback does quite well across a wide variety of ETFs. on May 21, 2008 at 11:59 pm | Reply Bill aka NO DooDahs! Sounds familiar … There’s a resemblance to this system. Agreed Bill – sounds similar. I’m adding your site to my blogroll – I stupidly forgot it when I was setting it up. Thanks for complement on the blog. Awesome site/strategy, will add you to my blog reader! Do you use any leveraged etfs? Also, wondering if you have played with the idea of shorting out of favor etfs? 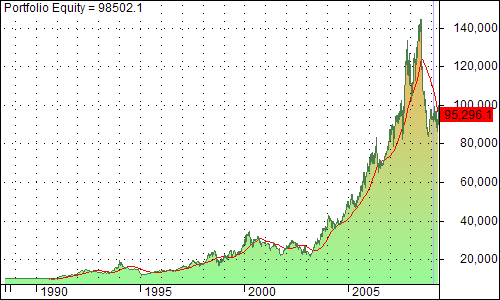 Or perhaps in order to reduce volatility, using option strategies with long positions? Thanks Scott – I’m checking our your blog as well. Yes, I do use the leveraged ETFs – not in this strategy at the moment – but I may be adding now that we have a bit more history and understand the behavior of the instruments a bit more (for instance, the ultra short ETFs have been acting in the way they were designed to, but probably not the way most people expected them to). I’ve looked at the shorting option and couldn’t make it work – it was consistently a loser vs. a long only strategy. And finally, I’ve done options or “juiced” a position using options – I use that more in the MR1 strategy. Thanks for stopping by and for the nice comments.